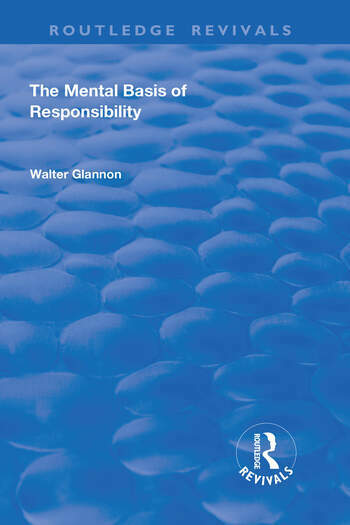 This title was first published in 2002: This book is an analysis of the ways in which mental states ground attributions of responsibility to persons. Particular features of the book include: attention to the agent’s epistemic capacity for beliefs about the foreseeable consequences of actions and omissions; attention to the essential role of emotions in prudential and moral reasoning; a conception of personal identity that can justify holding persons responsible at later times for actions performed at earlier times; an emphasis on neurobiology as the science that should inform our thinking about free will and responsibility; and the melding of literature on free will and responsibility in contemporary analytic philosophy with legal cases, abnormal psychology, neurology and psychiatry, which offers a richer texture to the general debate on the relevant issues. Contents: Introduction; The concept of responsibility: Individual responsibility; Causal control; Multiple causes; Moral luck; Alternative accounts; Causal versus moral responsibility; Summary; Normative Competence: Outline of a theory of action; Cognition and emotion; Conditions of responsibility; Excuses; When the will is free; Psychopathy; Summary; Personhood, Personal Identity, and Responsibility: Persons, sources, and resources; Theories of personal identity; A pragmatic conception of personal identity; Psychological disconnectedness and discontinuity; Responsible behaviour; Character and action; Summary; Cognitive Control and Content: Types of control; Frankfurt and alternative possibilities; Reasons for revising PAP'; Responsibility for failures; Ability and time; Remote causal control; Responsibility for consequences; Summary; The freedom we need to be responsible: Arguments for incompatibilism; Two senses of 'choice'; Mind and brain; Two objections; Libertarianism and moral significance; Summary; Conclusion; Bibliography; Index.